Choose this perfect dog collar design for a big mastiff dog! 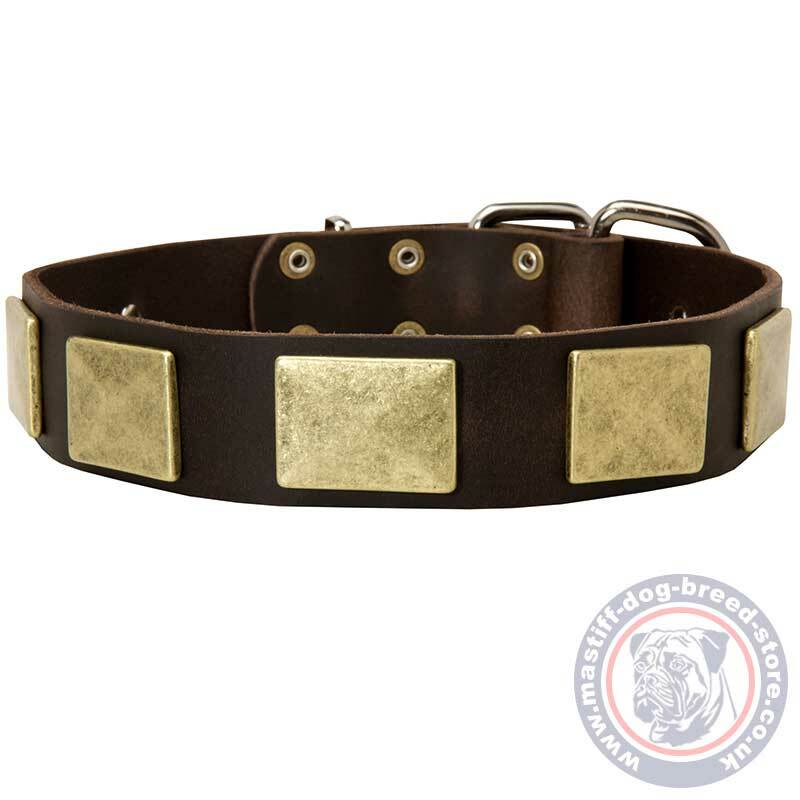 Leather dog collar with brass plates. Your Bullmastiff is a special dog. It is an original pure breed representative that requires special dog accessories. 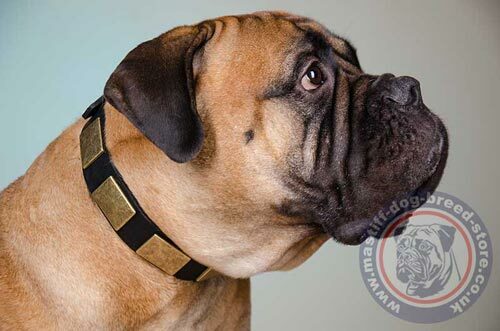 Make your Bullmastiff look elegant and feel comfortable with a vintage dog collar. It is designed especially for mastiff dog breeds to underline their power and regal bearing. Genuine leather dog collars are handmade by professionals. Handmade dog collars UK bestsellers will become the favorite tools for dog walking and training of your Bullmastiffs! Handmade dog collars are crafted with attention to every detail. Brass plates are smooth polished and reliably riveted. The leather belt is thick and wide to make your big dog controlled. 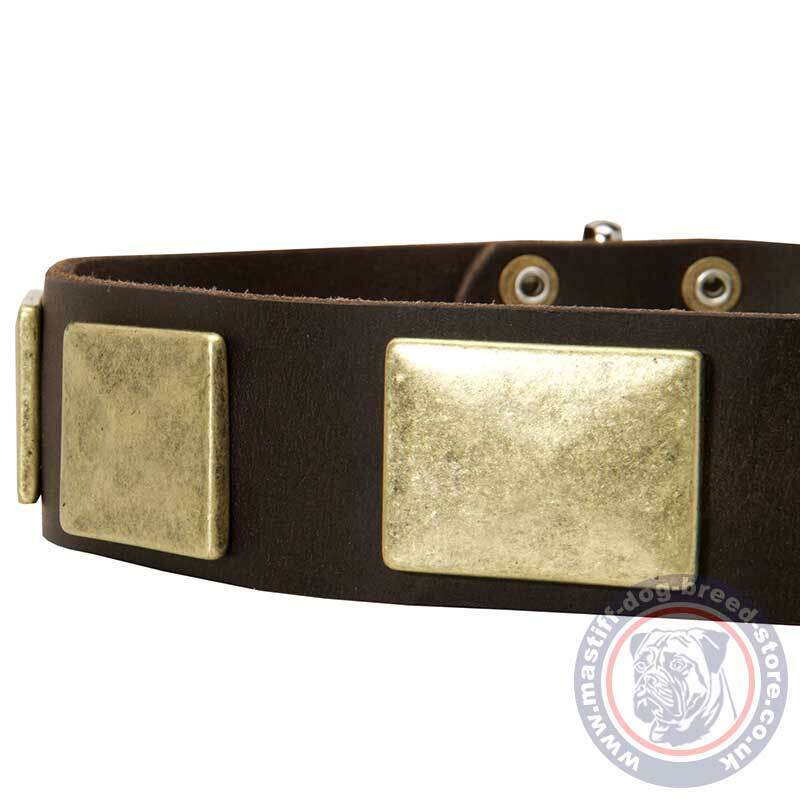 Strong brass buckle is intended to adjust the collar easily and regulate its size while your Bullmastiff is growing. As Bullmastiffs are growing till 2 years old, it is a n important characteristic of a collar for your young Bullmastiff dog. The tip of leather belt is fixed by square ring. Nothing exessive, the most functional and elegant details only. Neapolitan Mastiff looks brilliant wearing this fashionable, wide leather dog collar and brass plates underline its strength. Choose handmade dog collars UK favorite dog accessories!